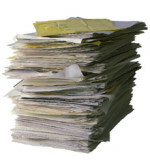 Losing the battle with paperwork? Can't find your car insurance certificate? Dreading the thought of a pending tax return? We can help you sort through and organise your papers and then set up simple, personalised and effective filing system that is easily managed. A session of four hours is charged at £185. See our real life 'Paperwork' before and after photos!